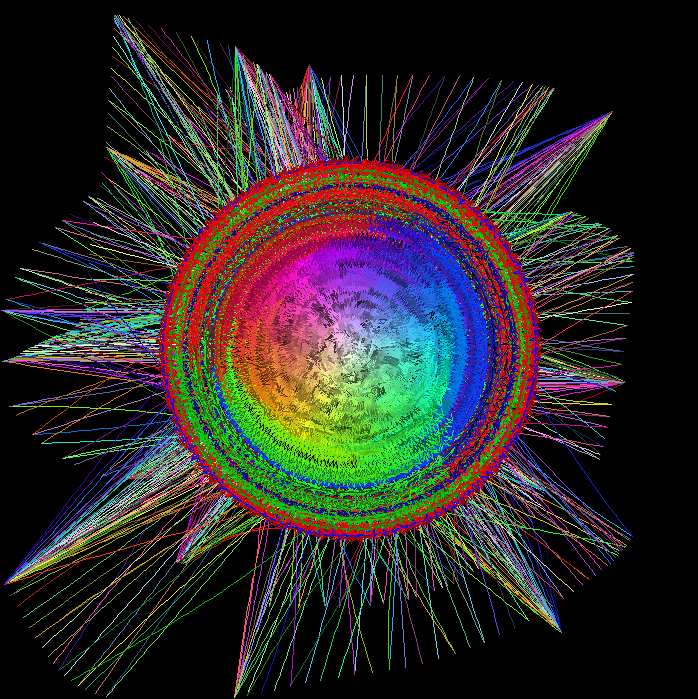 James has produced a spectacular motion graphics application in only about a hundred lines of code. You can now try a web version. Click the left mouse button to create randomly coloured lines emanating from the cursor. Drag the mouse with the left button down to create effects similar to the example shown below. The path of each line depends upon the red, green and blue components of its colour. In order to run program PixelSort, you will need to have downloaded Stefan Berinde`s wingraph.zip file as described in our Graphics tutorial. You should copy the unzipped wincrt.pas, wingraph.pas and winmouse.pas (from the src folder) into your program folder. (The compiled units are included in the zip file but you might as well have the source code available for reference). You should find these three files useful for your own motion graphics programs. We intend to replace this code with a commented version using meaningful variable names.